Washington (CNN) -- Federal prosecutors seeking to keep a terrorism suspect in Chicago behind bars while awaiting trial said Monday the suspect knew about last year's deadly Mumbai, India, terrorist attacks in advance. In court documents filed in Chicago, Illinois, prosecutors argued Tahawwur Hussein Rana should be detained because a secretly recorded conversation reveals he had knowledge of the planned attacks and supported them. In a transcript of the recorded conversation provided to the court, Rana praised the perpetrators. "They should be really commended. I appreciate them from my heart," Rana told an associate, according to the government transcript. Rana, whom U.S. authorities identify as a Pakistani native and Canadian citizen who lives mainly in Chicago, is charged in an unrelated case with providing material support to a conspiracy to commit a terrorist attack overseas. He faces a two-count complaint for allegedly assisting another terrorism suspect, David Headley, carry out surveillance of a Danish newspaper facility. A plot to attack the newspaper was not carried out, authorities say. 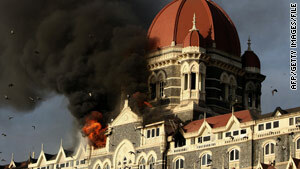 Headley last week pleaded not guilty to charges he faces in connection with the Denmark and India plots. The November 26, 2008, attacks in Mumbai killed at least 160 people, including six U.S. citizens. Headley, a Chicago man whose half-brother has said he grew up in the United States and Pakistan, was arrested October 3 in Chicago. He is scheduled for a federal court hearing in Chicago on January 12. Prosecutors said Rana's comments about knowledge of the Mumbai plot were made to Headley on September 7 during a long car ride. Rana allegedly learned of the plot from a terrorist-group contact during a trip to Dubai. Government lawyers say the intercepted conversation shows Rana is not telling the truth when he insists he believes in Mohandas Gandhi's nonviolent philosophy and was duped by Headley. "Simply put, Rana's own statements in this conversation, among others, completely belie his argument to this court he is either a dupe or a pacifist," Assistant U.S. Attorney Daniel Collins said. A hearing on whether to keep Rana behind bars pending trial is scheduled for Tuesday afternoon before federal Magistrate Judge Nan Nolan in U.S. District Court in Chicago.